In my V2 Cigs review, I discuss the many benefits of the V2 e-cigarette and how I believe those benefits would be useful for new e-smokers, such as the lifetime warranty on all components, the beautiful charging case and the top-notch packaging. The best V2 starter kit costs well over $100 though, and I know that not every new e-smoker will be comfortable spending that kind of money on their first starter kit. Maybe you aren’t completely sure that you’re ready to switch to e-cigarettes, or maybe you just can’t afford a more expensive starter kit. If you fall into either of these categories, I’d like to present a possible alternative with this Halo G6 review. See the Halo G6 at Halo’s website. It costs $44.99 and is available in nine different colors. If your order total exceeds $75, shipping is free. Use the coupon code VAPE4LESS during checkout to save 5% on any order from Halo Cigs. The Halo G6 is based on a type of battery called the KR-808. It’s the same type of battery used by V2 Cigs, and it’s popular because it’s extremely easy to use and a lot of people consider it one of the best available combinations of battery life, quantity of vapor per puff and small size. I’m one of those people; I almost always recommend KR-808 e-cigarettes for beginners. As you might imagine from the price difference, the Halo G6 is a bit less lavishly packaged than the V2 Cigs starter kit. Instead of a large box, the Halo G6 kit is packaged in a small metal tin with a molded divider keeping the components secure. You also get a bit less in terms of accessories; the Halo G6 kit includes less pre-filled cartridges and doesn’t include the nice carrying and charging cases of the V2 Ultimate Kit. What you do get, however, are two batteries, battery chargers for a wall outlet and USB port, five pre-filled cartridges and two empty cartridges you can fill yourself. You also have the rather unique benefit of owning an e-cigarette sold by a company that makes its own e-cigarette liquids. The e-smoking community almost universally considers Halo one of the top two or three e-liquid makers, and I’m inclined to agree. While almost all e-cigarette companies subcontract laboratories in China to create their e-liquids, Halo makes its own here in the United States. The differences in terms of creativity in flavor composition, vapor production and throat hit are quite noticeable. In my experience, the batteries included with the Halo G6 need a bit of charging when you first receive them. So, twist a battery into the end of the included USB charger, and then plug the charger into a USB port. You can also connect the charger to the wall adapter and charge the battery through a wall outlet. When the LED on the end of the battery shuts off, you can begin using it. The refill cartridges for the Halo G6 come nicely packaged in a little plastic case. So, to use one, you’ll just need to flip the case open, remove a cartridge, take the stoppers off and twist the cartridge into the battery. Then, take a long, slow puff to create vapor. If you bought your Halo G6 with a manual battery, you’ll also need to press the button. You can buy the Halo G6 with one automatic and one manual battery, which is what I typically recommend for people who aren’t sure which type they prefer. After a few hours of total use, you’ll start to see the vapor production decrease. A full Halo G6 cartridge tends to last a bit longer than a fully charged battery, so you’ll most likely see the light on the end of the battery begin to blink after a few more puffs. Swap the battery out, place the dead battery on the charger and continue. If the vapor production decreases when you’re using a fully charged battery, you’ll know it’s time to replace or refill the cartridge. After a company sells you an e-cigarette kit, the only way they can continue earning money is by selling you refill cartridges or bottled e-cigarette liquid. For this reason, companies that don’t sell e-liquid by the bottle often make their cartridges difficult to open so you’ll be disinclined to refill them. Since Halo makes its own e-liquids, they’re just as happy whether you buy it in bottles or pre-filled cartridges. As a result, Halo’s cartridges are extremely easy to open with a fingernail. Once the cartridge is open, add a little liquid from a bottle until the white gauze inside the cartridge looks wet and replace the stopper. If you decide that you prefer to spend a bit less by buying bottled e-liquids, Halo sells 18 different flavors starting at $5.99 each. Empty Halo G6 cartridges cost $8.99 for per pack of five and you can expect to fill each one several times before the heating coil starts to degrade and cause decreased vapor production. Your final option is to buy pre-filled cartridges. These are currently available in eight different flavors and cost $9.99 per pack of five. The pre-filled flavors are exactly the same as those available by the bottle. So, if you have a choice of V2 vs. Halo, which should you buy? It’s a tough one. I prefer the V2 Cigs kit in terms of the quality of the hardware, the accessories included with the kit and the overall vapor production of the e-cigarette. 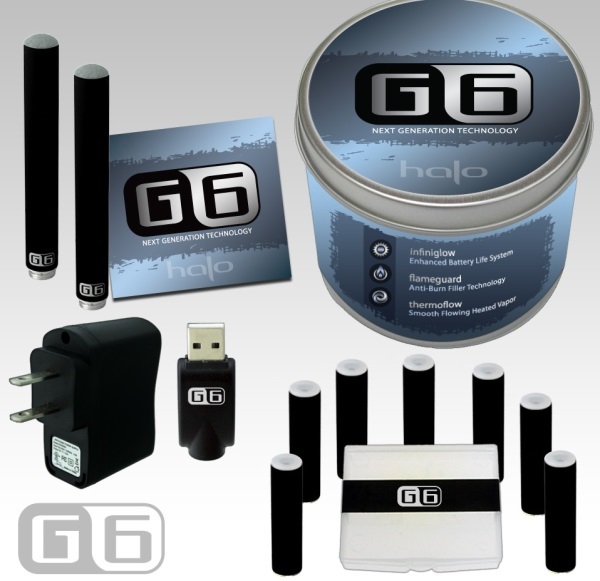 The Halo G6 isn’t far behind in vapor production, though, and it has the added benefit of Halo’s superior USA-made refill flavors. See the Halo G6 at Halo’s website. It costs $44.99 and is available in nine different colors. If your order total exceeds $75, shipping is free. Use the coupon code VAPE4LESS during checkout to save 5 percent on any order from Halo Cigs.